Local clubs have discovered their fate for the early rounds of next season’s FA competitions. AFC Rushden & Diamonds will enter the Emirates FA Cup in the preliminary round and will travel to either Deeping Rangers or Holbeach United on August 25 as the United Counties League Premier Division rivals do battle in the extra preliminary round. 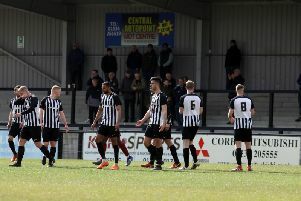 Corby Town, meanwhile, also start in the preliminary round and will take on Evo-Stik South League Division One Central rivals Dunstable Town at Steel Park. The Steelmen also face opposition from their own league in the extra preliminary round of the Buildbase FA Trophy when they head to Bromsgrove Sporting on September 29 with the winners of that tie hosting Yaxley in the preliminary round on October 18. Kettering Town are exempt to the first qualifying round of the FA Cup while the Poppies and Diamonds will enter the FA Trophy at the same stage. After their fine run in the competition last season, Desborough Town won’t enter the FA Vase in the forthcoming campaign until the second round proper. Extra preliminary round: Whitworth v Harborough, Raunds v Eynesbury, Arlesey v Desborough, Biggleswade United v Wellingborough Town, Rothwell Corinthians v Pinchbeck. Ties to be played on Saturday, August 11. Winners of each tie receive £2,250. Preliminary round: Deeping or Holbeach v AFC Rushden & Diamonds, Corby v Dunstable Town, Whitworth or Harborough v Cambridge City, Arlesey or Desborough v Kempston Rovers, Histon or Peterborough Northern Star v Raunds or Eynesbury, Barton Rovers v Rothwell Corinthians or Pinchbeck, Spalding United v Biggleswade United or Wellingborough Town. Ties to be played on Saturday, August 25. Winners of each tie receive £2,890. Extra preliminary round: Bromsgrove Sporting v Corby Town. Tie to be played on Saturday, September 29. Winners of each tie receive £2,000. Preliminary round: Bromsgrove Sporting or Corby Town v Yaxley. Ties to be played on Saturday, October 18. Winners of each tie receive £3,000. First qualifying round: Rothwell Corinthians v CB Hounslow United, Whitworth v Bugbrooke, Rushden & Higham v Winslow United, Raunds v Cranfield United. Ties to be played on Saturday, September 1. Winners of each tie receive £550. Second qualifying round: Potton United v Rothwell Corinthians or CB Hounslow United, Whitworth or Bugbrooke v Spelthorne Sports or ON Chenecks, Bedfont & Feltham v Rushden & Higham or Winslow United, Leverstock Green or Unite MK v Raunds or Cranfield United, Wellingborough Town v Burnham, Burton Park Wanderers v FC Deportivo Galicia or London Tigers, Arlesey v Irchester, Rayners Lane v Thrapston. Ties to be played on Saturday, September 15. Winners of each tie receive £725.